Andrew Kennedy's Angling Blog at Just-Fish.co.uk - Fishing Blog Coarse Fly Lure Pike Perch: See, I can still catch perch! See, I can still catch perch! Sorry everyone, this post is almost 2 months late! I started typing it shortly after the session and then never got the time to finish it! So for now, here's a slightly rushed post, but I've a fair bit of fishing planned in the near future so expect a flurry of activity on here very soon! A couple of weeks after the rivers closed I headed to local fishery, Tibshelf Ponds, to target the resident perch which are numerous (It used to be my local water and I would catch several every time I fished there as a child), but I had an incling that there were some really large ones there to be caught too. I set up with a combination of a swimfeeder rod (switching between a groundbait feeder & maggot feeder) and a heavy pole float fished on a new bolognese rod that I'd bought and was keen to try out. Bolognese rods have never really taken off in the UK, they are designed to fish the deep canals & slow rivers of mainland Europe, and they're basically a telescopic whip (mine's 6 metres long) with a reel seat and a rod ring on every section. They're not very good for casting, but I bought mine to allow me to fish very light with the sensitivity and precision of a pole, but with the playing abilities of a rod and reel, especially beneficial when a large fish is hooked. In reality, it's not quite as good as a pole or rod & reel, but I don't like relying on a piece of elastic to "play" my fish for me, so it's a useable substitute for a pole that caters to my own desires and stupid prejudices! Over the course of the day I landed most of my perch on the float and was amazed at the fights on the bolognese. 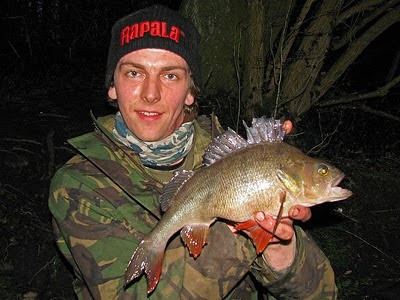 Even modest 6oz fish would feel like 1lb+ brutes as they fought against the huge rod; it made catching small perch so much more fun and then when a 1lb 3oz fish finally took a liking to my worms, it gave me a proper tussle! The bites dried up around the middle part of the day, as they so often do with perch, but eventually my air-injected lobworm started receiving some serious fishy attention. I missed bite after bite - probably small perch - whether I struck immediately or let the run develop made no difference, I just couldn't connect! Then I managed to connect with the next three consecutive bites! The first fish kept me guessing all the way to the net. It was fighting hard but didn't feel like a perch and I couldn't decide between perch, tench or carp. A flash of green gave me a moment of hope, but as it surfaced properly a rubbery yellow mouth gave it away; it was a tench. Next cast I struck at a very perch-like sharp, stuttering run, which turned into a head-thrashing, hectic, perch-like fight. After a close encounter with some submerged Norfolk reeds a perch looking easily 2lbs graced the net. Unfortunately, this pot-bellied, thuggish-looking perch (check out its protruding bottom lip!) had recently spawned, so that pot-belly was empty and she weighed 2 ounces shy of 2lbs, making it my biggest bait-caught perch to date (for some reason, all my biggies take lures!) and a personal best for that water. Darkness was fast approaching and the fish were hard on the feed, so I quickly re-cast. About 10 minutes later I got another run which turned out to be yet another species, a chub of around 3lb. It wasn't what I came for but it was a lovely fish and would be one of the fish I used to catch in my teens, which were stocked at about 4oz, 15 or so years ago. I still have photos of my beaming face behind a tiny chub at Tibby ponds! Anyway, here is the photo of the perch. A bit more writing to follow soon I promise!